Schwabing is Munich’s avant-garde district and a magnet for locals and visitors alike thanks to its diverse range of drinking establishments, gourmet eateries and intriguing boutiques. The neighbourhood came to fame in the late 19th century when it was home to an impressive group of poets, painters and writers, including Rainer Maria Rilke and Heinrich Mann. 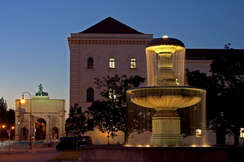 Having gained a reputation as Munich’s artistic quarter, Schwabing remains an important creative and social hub today. Located in the northern part of the city, Schwabing is a lively shopping destination by day and is packed full of boutiques, jewellery stores and art galleries. At night the area is transformed into an energetic entertainment venue and is home to many contemporary bars and restaurants. Bordered by the Olympic park to the west and the stunning Englischer Garten – one of the world’s largest public parks – to the east, and with two of the city’s universities nearby, it is constantly buzzing with vitality. This long boulevard is lined with fashionable stores, restaurants and bars and runs all the way from spectacular, triple-arched Siegestor, or Victory Gate, through to Münchner Freiheit and the English Garden. Built to bookend the Feldherrnhalle and mark the end of Ludwigstrasse, nowadays also marks the beginning of Leopoldstrasse. Unsurprisingly, it has Italian origins and was modeled on the Arch of Constantine in Rome. It was built (1843–52) to honor the achievements of the Bavarian army during the Wars of Liberation (1813–15) against Napoléon. Wandering down Leopoldstreet you will pass the Walking Man . 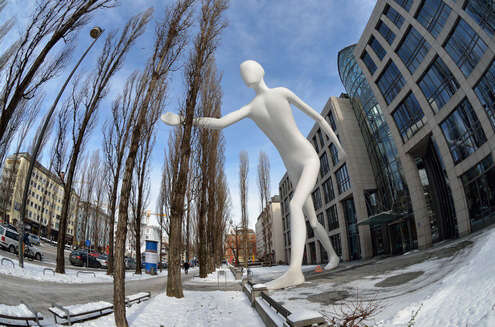 A 17 m high (56 feet) and 16 ton heavy (35.000 lb) white sculpture made from steel. It is located outside the premises of an insurance company which commissioned this sculpture from the American artist Jonathan Borofsky. Wandering along Kaiserstrasse , be sure to visit St.Ursula Church on Kaiser square, the cathedral from Schwabing, one of Munich´s most beautiful churches, built in the Italian style. This market is charming with hanging lanterns scattered throughout, but what is really impressing about it is the artisans and unique handicrafts on show. 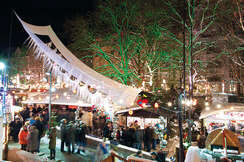 It has some of the most talented artisans one can see at any Christmas market and it definitely has a bohemian vibe. There’s also an Art Tent where vendors display their larger works of arts. A sculpture path meanders throughout the whole market area. This market will be especially appreciated by anyone with an interest in art, or those looking for a unique gift. Encompassing lakes, woods, gently rolling terrain and flower-dusted meadows, the park is gloriously green and generously big: it spans 350 hectares and so is larger than London’s Hyde Park. It was created in the 18th century ostensibly in the style of an English country park, hence the name. Eye-catching additions over the ensuing years include a Japanese teahouse, a Greek temple, a pagoda and the Chinese Tower. 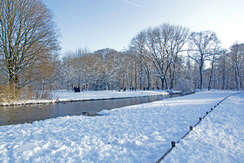 In winter Englischer Garten is just as much of a must-visit as in summer.